We’d love your help. Let us know what’s wrong with this preview of Unstoppable by Ralph Nader. Ralph Nader, one of the most influential Americans of the 20th century, has fought for justice in America for over half a century. He strongly believes that—contrary to conventional political wisdom regarding extreme partisanship—significant change can be accomplished by focusing on issues that most Americans, regardless of political labels, agree are important and need to Ralph Nader, one of the most influential Americans of the 20th century, has fought for justice in America for over half a century. He strongly believes that—contrary to conventional political wisdom regarding extreme partisanship—significant change can be accomplished by focusing on issues that most Americans, regardless of political labels, agree are important and need to be addressed. This book is about the emerging political re-alignment that is combining the Left and the Right against corporate tyranny. Ralph Nader has probably pushed through more pieces of important federal legislation than most members of Congress (a low bar these days, I know). He's fiercely passionate about the issues he works on, but that only gets you so far. Nader is also a savvy strategist who knows how to start building consensus, something that's become increasingly difficult to do in the current my-way-or-the-highway political climate. But a modern left-right alliance is perfectly possible, he argues, and it's the onl Ralph Nader has probably pushed through more pieces of important federal legislation than most members of Congress (a low bar these days, I know). He's fiercely passionate about the issues he works on, but that only gets you so far. Nader is also a savvy strategist who knows how to start building consensus, something that's become increasingly difficult to do in the current my-way-or-the-highway political climate. But a modern left-right alliance is perfectly possible, he argues, and it's the only way to rein in the corporate plutocracy that is stomping all over our democracy. Addressing reasonable people on the left and right, Nader lays out a number of big issues where common ground can be found, with detailed reasoning. He acknowledges some of the challenges, and usually offers suggestions for leaping those hurdles. And he doesn't give either side a pass. He castigates both for their missteps and hypocrisies. Ralph Nader is, as ever, a straight-shooter. For the skeptics, he shows that cooperation between left and right--even now--is more common than the media and many politicians would have us believe, and gives specific examples. A well-conceived guide for moving forward, from someone who's been in the trenches for decades. "Wonky" is the word. Fact-based, optimism-tainted. It's hard to disagree with Ol Ralph but very easy to differ. He rails against the corporate state we find ourselves in, points to feasible ways out and areas of what should be easy accord among liberals and con-- libs and cons-- LC's. He smashes the terms together to suggest there will be plenty of people in the middle, in a political union. I'm just much more pessimistic. Ralph HAS to be optimistic to do what he does. Especially when he rails a "Wonky" is the word. Fact-based, optimism-tainted. It's hard to disagree with Ol Ralph but very easy to differ. He rails against the corporate state we find ourselves in, points to feasible ways out and areas of what should be easy accord among liberals and con-- libs and cons-- LC's. He smashes the terms together to suggest there will be plenty of people in the middle, in a political union. I'm just much more pessimistic. Ralph HAS to be optimistic to do what he does. Especially when he rails against today's youth and their immersion in "screens" instead of one another. Well, sorry Ralph, we are only the creatures we evolved to be. Idealists, optimists, by their nature, deny or reject human nature. This is further evidence of the futility of hope. Bright-side documentation of disaster. Is there anything in human history to suggest that we could universally agree on a course of action? Combat something as grim and long-term as climate change? We are a frail, fractious species and there are simply more important issues than our political gridlock. George Carlin groused that when he heard the word bipartisanship, he knew a larger than usual deception was in the works. Ralph Nader's Unstoppable offers a different kind of bipartisanship -- cooperation, not conspiracy. Written primarily to a progressive audience, Nader draws on his reading of Russell Kirk and F.A. Hayek to share the good news: there are people who share the similar values in both political wings, and plenty of room to work together against a common enemy. What common enemy? T George Carlin groused that when he heard the word bipartisanship, he knew a larger than usual deception was in the works. 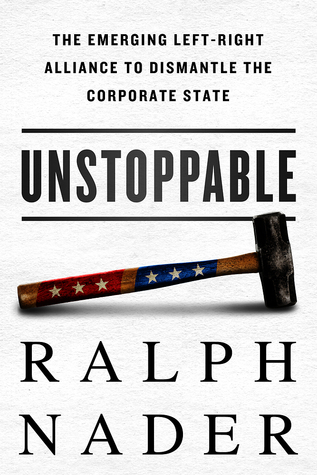 Ralph Nader's Unstoppable offers a different kind of bipartisanship -- cooperation, not conspiracy. Written primarily to a progressive audience, Nader draws on his reading of Russell Kirk and F.A. Hayek to share the good news: there are people who share the similar values in both political wings, and plenty of room to work together against a common enemy. What common enemy? The crony-capitalist state, the nemesis of both progressives who fear the power of modern-day robber barons, and of libertarians and conservatives who value free markets, the rule of law, and civic order. Nader opens Unstoppable with a victory several decades old: the termination of a particular nuclear project based on a alliance between progressive environmentalists and fiscal conservatives. Although joining forces with conservatives was initially a pragmatic move, in the decades that followed, Nader familiarized himself with both conservative and libertarian literature. Nader deserves kudos, for while it's not unusual for those passionate about politics to learn their opponents' arguments merely to demonstrate to them while they are wrong, Nader seems to have gained a genuine sense of empathy for those on the other side. Humanistic concern runs through each political camp considered here, a commonality that can be the basis of cooperative action. What most progressives think of as conservatism, Nader writes, is a new thing, the product of decades of slow corporate corruption of the political state. Its subsidies to multinationals, the benefaction rendered by regulations that smother competition, conserve nothing -- and nor do they promote liberty. Nader may still disagree those on the right, but underneath the ideology, he writes, we are still human beings who, when confronted with abuses, want to help one another. The alliances that can be created vary. Progressivism's opponents may agree on opposing the State's growing activity in everyday life, but they don't agree with one another. Take the environment: some of the United States' most sweeping conservationist legislation was enacted by presidents like Theodore Roosevelt and Richard Nixon, and environmentalism lends itself well to the language of conservatism; think 'stewardship'. Progressive horror at the inroads consumerism is making in the lives of children can find kindred spirits in the ranks of social conservatives, especially the religious who fear their children becoming selfish and materialistic. Libertarians who swear more by the market than moral order may object to progressive-conservatives limiting choice by barring certain kinds of advertising, for instance, but when it comes to forswearing money given to corporations they're stalwart allies. Another area of progressive-libertarian camaraderie is ending the drug war, which even Old Right types could be convinced to join if shown how the war has completely destroyed civil law enforcement in favor of pseudo-military police enforcement. Free trade is a particularly thorny issue: libertarians may be for it, and paleo-conservatives against it, but there's a fuzzy thin line between protectionism (which progressives might back) and cronyism. In the latter half of his book, Nader puts forth a list of twenty-five issues that progressives can work with either libertarians or paleo- and populist conservatives on, or both. Some of them involve the federal government doing more, which I don't think will sell well in allying with groups who view federal overreach as the entire point of opposition. It's a let's-get-the-Wehrmacht-out-of-Paris-before-we-strengthen-it-against-Stalin situation. Others involve a heart dose of localism. like promoting 'community self reliance', and distributive electrical grids. At one point Nader quoted Who Owns America?, the classic agrarian-distributist critique of the then- nascent plutocracy, and I may have swooned. Considering that two of the major contenders for the presidency have nebulous connections to their respective parties -- the independent socialist Sanders and the populist Trump -- Americans' frustration with the reigning RepubliCrat scheme seems ripe for this kind of cooperation. I only wish Nader had put more emphasis on local cooperation, which is further removed from ideology, and more motivated by having to work with the facts at hand. Non-progressives will find Nader's repeated assertion that progressives have less interest in ideology than facts to be dubious, and for the record I think that comes a little too close to holding that the ends are more important than the means. It's not enough to take steps to take care of what ails us: we should have some idea of where we are going. If we allow power to accrete in the name of "doing something", then we'll simply pave the way for future abuses. Quarrels withstanding I found Unstoppable to be an immensely heartening book, a reassuring dose of civility and cooperation. I think if more Americans read it -- progressives, liberals, conservatives, and even those power-enabling rascals in the middle, the liberals and neocons, we might see each other more as people with genuine convictions, and not merely wrongheaded enemies who need to be defeated and driven from the field. When the talking heads on TV, both the announcers and the candidates, drive one to despair, consider Nader's humane rebuttal. Genuine hope for America may not be forlorn. I'm too young to have been a Nader voter back in 2000, but having read this short political screed by the former Green Party nom, I might have been. Respected as he is by those on both the Left and the Right, Ralph Nader attempts to make the case that most politically-active Americans have strong areas of convergence when it comes to restraining and dismantling the corporate state. Instead of focusing on the social issues that are used to divide and incite the population every election cycle, he I'm too young to have been a Nader voter back in 2000, but having read this short political screed by the former Green Party nom, I might have been. And he's right! On many of these issues, people on both sides of the political spectrum would agree, though I think he does overstate the conservative case for environmentalism — he must not speak to the same armchair conservatives that I do, the Baby Boomer types in strong denial about their contributions to the destruction of their ecological inheritance. But that's a digression. Nader spends a lot of energy on conservatives, pointing out areas where thought leaders champion these areas of convergence. And I think that's a good thing, because the Fox News-esque caricature of the conservative has become a non-starter to dialogue for at least the last 20 years. Similarly, he takes down liberals for overlooking moldy areas in their own ideological backyard, like labor union corruption and the breathless defense of any and all entitlement programs. The book is measured and thoughtful, and is likely to ring true in a lot of ways to thoughtful people on whatever part of the political spectrum one falls. But what prevents this book from being a real must-read on political convergence is his prescription for the future. Some of them are just highly unlikely, like the enactment of a transaction tax on Wall Street transactions to pay for a Wall Street watchdog agency. We can all ride our flying pigs to Washington to see that one enacted. But far and away the most glaring is his repeated appeals to billionaires to help fund one or another of his policy ideas. The book even finishes with a letter to billionaires to come and fund efforts to advance convergence. I was attracted to the idea of finding common ground between right and left as the basis for political change, and I'll give credit to Nader for the attempt. On occasion Nader notes an equal share of blame for "corporatism" between right and left, but he just can't resist placing most of the blame for every ill in the world on conservatives. He cherry picks his historical "facts" and quotes from noted conservative thinkers, showing them as "reasonable" but only so he can attack the unreasonablene I was attracted to the idea of finding common ground between right and left as the basis for political change, and I'll give credit to Nader for the attempt. Come on, Ralph. There's no difference between the set of conservative or liberal politicians when it comes to power, ego, and reliance on special interests. Some are honorable, some are skunks. And not EVERY corporation in the world is greedy and evil. There is no one "corporate interest" steering everything. Corporations often work at cross purposes. And what about the many money-spreading organizations that are technically not "corporations" like the NRA, or AARP, or various Union, Religious or Environmental groups? These can be just as corrupting as corporations. I would have found Nader's arguments more compelling had he presented them with more objectivity. I think he's so intensely focused outside of the book on bashing "corporations" and "conservatives" that he has a hard time escaping his bias inside the book - to the detriment of his overall desire for common ground. Philosophically, this is one of the deepest books by Nader that I have read. The overall argument or thesis of the book is convincing: the Left & Right would be more effective if they were to converge and join forces, and despite what most would call obvious conflicts of interest, there are plenty of areas where both sides share common ground. Nader presents convergence as the most plausible and effective way forward. After reading this book, I'd have to agree. Great book describing how in many ways we all want some of the same things, no matter the label we attach to ourselves. No one would say clean water to drink isn't important, nor public safety from goods known by the maker to be defective. I think all elected officials should read this book... our infrastructure needs agreement and action from our leaders, not more red herring arguments about social issues and personal pride. Absolutely loved this book! Nader understands our government and knows many of the movers and shakers in both parties. The point of this book is to move beyond party politics, especially given the inability of our two party system to perform their duties, efficiently and effectively. Ralph encourages citizens to look beyond all of the media hype and to think about issues as they stand, independent of party politics. This is a must read for any who have felt that there was no hope for future changes to the good for our country. Nader points out the convergence over certain issues that are shared across ideological boundaries. There is a path that he describe that holds hope for a change from the stasis of our current government to proceed cooperatively. Read and be recharged in new but old ways to work in the political climate that now exists. God bless Ralph Nader. This was really a little wonky for me, but Nader's ideas of convergence between the left and the right on issues they can agree upon (and yes, there are such issues despite what the media tries to tell us) are an ideal to aspire to. An interesting book especially given the recent political developments in this country. Nader argues that liberals and conservatives actually have many ideals and goals in common and that they should " converge" to effect change. He describes how he believes this can happen. I hope he is right. As a reviewer noted, very wonky. Interesting ideas. though it sure looks today like the right an left are far away and apart.... the needs and dreams of people are the same, as is our foe, the corporate state. encouraging. Just a list of nice ideas, and Nader explaining them instead of how to bring them to be. Reading this book felt a little like taking a peek into the past rather than the future. Nader, whose unique brand of intelligent activism has inspired legislation and given rise to consumer awareness like few others have, is an unquestionable leader among those citizens who believe optimistically that the best days are still ahead of us. The premise of his book is that even through people on the extreme ends of the ideological and political spectrum positive change is possible through a converge Reading this book felt a little like taking a peek into the past rather than the future. Nader, whose unique brand of intelligent activism has inspired legislation and given rise to consumer awareness like few others have, is an unquestionable leader among those citizens who believe optimistically that the best days are still ahead of us. The premise of his book is that even through people on the extreme ends of the ideological and political spectrum positive change is possible through a convergence of power and expenditure of political will toward shared goals or sought ends. His optimism in this regard is rare, and perhaps dated, as political realities show a polarization that may be insurmountable without a full-scale revolution. On so many issues and in Nader's citations of conservative icons of the past (Hayeck, von Mises, and others), he is right on target with his analysis; it's his optimism about the potential of a coming together of the minds that seems to be a bridge too far, as the current polarization of ideas have made enemies of the heart, with its passions, not the mind, with its rationality. Nevertheless, Nader recognizes the difficulty, and yet he plows through it with sustained optimism and a worthwhile, admirable rationale. UNSTOPPABLE might catch readers off guard with how much it feels like an activist's handbook, but Nader's m.o. is to galvanize disgruntled citizens to action, not philosophy. It's all pragmatic and motivating, with healthy doses of historical examples of when left-right convergence was necessary and successful. If you're halfway out the door to organizing like-minded people for positive change in the world, or even your local community, UNSTOPPABLE will light a fire under you. Corporations are neither conservative nor liberal, but work to undermine both sets of values. And that left and right (not so far apart as they might have thought) can and have combined to put an end to unconstitutional corporate rule. Nader's newest book is intriguing. It seeks to find topics on which the left and right can agree and make progress. Some of them like climate change, seem to be beyond Americans limited capabilities to understand. Others like prison reform, might have a chance. Areas of particular concern to Nader include consumer rights, humanitarianism, environmentalism, and democratic government. Nader is the first Arab American pr American attorney, author, lecturer, political activist, and candidate for President of the United States in five elections, including the last election 0f 2008, with his role in the 2000 election in particular being subject to much debate.